Erythroleukemia is a subtype of acute myeloid leukemia (AML) that is distinguished by erythroblastic proliferation. Patients usuallly present with nonspecific signs and symptoms from the anemia, thrombocytopenia, and leukopenia resulting from the replacement of bone marrow by leukemic cells (see Presentation). Bone marrow aspiration and biopsy are critical in making the diagnosis of acute erythroleukemia (see the image below, and Workup). The treatment of acute erythroleukemia is similar to that used for other subtypes of AML (see Treatment and Medication). 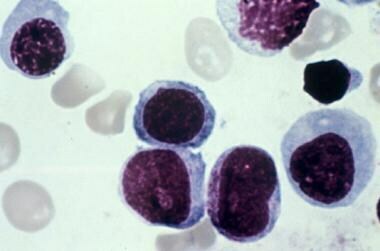 Bone marrow aspirate showing erythroblasts in a patient with erythroleukemia. Courtesy of Maurice Barcos, MD, PhD, Department of Pathology, Roswell Park Cancer Institute, Buffalo, NY. Ionizing radiation - Thorium dioxide suspension (Thorotrast), a radiographic contrast medium used in the 1940s, is associated with increased risk of erythroleukemia (latent period of 10-30 y after exposure). Previous exposure to chemotherapy drugs (eg, alkylating agents) - These agents may be used in the treatment of Hodgkin lymphoma, multiple myeloma, bone marrow transplant, ovarian cancer, breast cancer, and nonneoplastic disorders (eg, collagen-vascular disease). Rare cases of familial erythroleukemia (autosomal dominant with variable penetrance), manifesting in the sixth decade of life. Acute erythroleukemia accounts for 3-5% of all de novo AMLs and 20-30% of secondary leukemias. The incidence of erythroleukemia increases in people older than 50 years. Mazzella et al described 2 peaks, one in the seventh decade of life and a second, smaller peak in the fourth decade. [2, 6] Although very rare in children, M6 AML has been reported in children from the newborn period through age 7 years. Occurrence has a slight male predominance. No racial predilection is known. Patients with acute erythroleukemia have a poor prognosis. Problems encountered in the treatment of acute erythroleukemia include primary induction failure, relapse, and the toxicity of chemotherapeutic agents. Findings from cytogenetic evaluation affect the prognosis. No specific chromosome abnormalities are associated with this subtype. Multidrug resistant phenotype (positive Pgp expression) is associated with a poor prognosis. Determining the myeloblast-to-erythroblast ratio at diagnosis helps to predict prognosis; a higher ratio is associated with a favorable prognosis. In a study of 91 patients with newly diagnosed erythroleukemia, Santos et al compared the disease’s prognosis with that of patients in a control group suffering from other subtypes of AML. A history of the predisposing factor MDS was present in 50% of the patients in the erythroleukemia group and 41% of the patients in the control group. Poor-risk cytogenetics were present in 61% of the erythroleukemia patients and 38% of the control patients. Complete remission rates were 62% in the erythroleukemia group and 58% in the control group. The median period of disease-free survival was 32 weeks for erythroleukemia patients and 49 weeks for control subjects. The median period of overall survival was 36 weeks for erythroleukemia patients and 43 weeks for control subjects. After carrying out a multivariate analysis, the report’s authors concluded that erythroleukemia is not an independent risk factor in disease-free and overall survival, and that well-known AML prognostic factors should guide treatment decisions. A less favorable outcome may be observed in elderly patients, in patients with secondary erythroleukemia (usually after treatment with alkylating agents), and in patients with unfavorable cytogenetics. Patients should be educated about the signs of febrile neutropenia and thrombocytopenia. The long-term adverse effects of chemotherapeutic agents must be clearly explained, and issues related to chemotherapy-associated infertility (eg, sperm banking) must be presented and discussed. Procedure-related adverse effects and failure to obtain informed consent should also be addressed. Boddu P, Benton CB, Wang W, Borthakur G, Khoury JD, Pemmaraju N. Erythroleukemia-historical perspectives and recent advances in diagnosis and management. Blood Rev. 2018 Mar. 32 (2):96-105. [Medline]. Mazzella FM, Alvares C, Kowal-Vern A, Schumacher HR. The acute erythroleukemias. Clin Lab Med. 2000 Mar. 20(1):119-37. [Medline]. Acevedo-Olvera LF, Diaz-Garcia H, Parra-Barrera A, Caceres-Perez AA, Gutierrez-Iglesias G, Rangel-Corona R, et al. Inhibition of the Na+/H+ antiporter induces cell death in TF-1 erythroleukemia cells stimulated by the stem cell factor. Cytokine. 2015 Sep. 75 (1):142-50. [Medline]. Calvo X, Arenillas L, Luño E, Senent L, Arnan M, Ramos F, et al. Erythroleukemia shares biological features and outcome with myelodysplastic syndromes with excess blasts: a rationale for its inclusion into future classifications of myelodysplastic syndromes. Mod Pathol. 2016 Dec. 29 (12):1541-1551. [Medline]. [Full Text]. Mazzella FM, Kowal-Vern A, Shrit MA, et al. Effects of multidrug resistance gene expression in acute erythroleukemia. Mod Pathol. 2000 Apr. 13(4):407-13. [Medline]. Santos FP, Faderl S, Garcia-Manero G, Koller C, Beran M, O'Brien S, et al. Adult acute erythroleukemia: an analysis of 91 patients treated at a single institution. Leukemia. 2009 Sep 10. [Medline]. Kowal-Vern A, Mazzella FM, Cotelingam JD, et al. Diagnosis and characterization of acute erythroleukemia subsets by determining the percentages of myeloblasts and proerythroblasts in 69 cases. Am J Hematol. 2000 Sep. 65(1):5-13. [Medline]. Liu W, Hasserjian RP, Hu Y, Zhang L, Miranda RN, Medeiros LJ, et al. Pure erythroid leukemia: a reassessment of the entity using the 2008 World Health Organization classification. Mod Pathol. 2011 Mar. 24(3):375-83. [Medline]. Peng J, Hasserjian RP, Tang G, Patel KP, Goswami M, Jabbour EJ, et al. Myelodysplastic Syndromes Following Therapy with Hypomethylating Agents (HMAs): Development of Acute Erythroleukemia May Not Influence Assessment of Treatment Response. Leuk Lymphoma. 2015 Aug 21. 1-19. [Medline]. Bennett JM, Catovsky D, Daniel MT, et al. Proposed revised criteria for the classification of acute myeloid leukemia. A report of the French-American-British Cooperative Group. Ann Intern Med. 1985 Oct. 103(4):620-5. [Medline]. Arber DA. Revisiting erythroleukemia. Curr Opin Hematol. 2017 Mar. 24 (2):146-151. [Medline]. Cuneo A, Van Orshoven A, Michaux JL, et al. Morphologic, immunologic and cytogenetic studies in erythroleukaemia: evidence for multilineage involvement and identification of two distinct cytogenetic-clinicopathological types. Br J Haematol. 1990 Jul. 75(3):346-54. [Medline]. McHayleh W, Sehgal R, Redner RL, Raptis A, Agha M, Natale J, et al. Mitoxantrone and etoposide in patients with newly diagnosed acute myeloid leukemia with persistent leukemia after a course of therapy with cytarabine and idarubicin. Leuk Lymphoma. 2009 Oct 8. [Medline]. Stoneking CJ, Mason MJ. Mg2+ modulation of the single-channel properties of KCa3.1 in human erythroleukemia cells. Pflugers Arch. 2013 Nov 6. [Medline]. Mayer RJ, Davis RB, Schiffer CA, et al. Intensive postremission chemotherapy in adults with acute myeloid leukemia. Cancer and Leukemia Group B. N Engl J Med. 1994 Oct 6. 331(14):896-903. [Medline]. Wiernik PH, Banks PL, Case DC Jr, et al. Cytarabine plus idarubicin or daunorubicin as induction and consolidation therapy for previously untreated adult patients with acute myeloid leukemia. Blood. 1992 Jan 15. 79(2):313-9. [Medline]. Swerdlow SH, Campo E, Harris NL, et al. WHO Classification of Tumours of Haematopoietic and Lymphoid Tissues. 4th ed. Geneva, Switzerland: WHO Press; 2008.